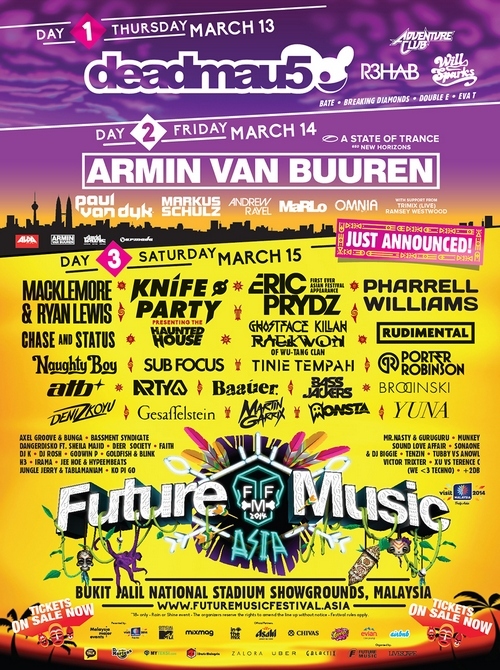 The organizers of Future Music Festival Asia, Future Music Australia and Livescape Asia today announced the much anticipated set times for the festival which will be held at the Bukit Jalil National Stadium Showgrounds from 13 – 15 March 2014. Doors open at 4.00PM on all days. For more information or to obtain updates on the festival, logon to: www.futuremusicfestival.asia or www.facebook.com/futuremusicasia. Visit also www.astateoftrance.com for more information on Armin Van Buuren’s A State of Trance 650: New Horizons. General and VIP tickets are priced from RM208 (for a single day pass) to RM588 (VIP) and are available for purchase via www.futuremusicfestival.asia. For exclusive VIP or private cabana packages, contact Livescape Asia at +60.3.7772.6272 (10PM – 6.00PM, Mondays to Fridays only). Tickets are selling fast and are expected to sell out in early March. Future Music Festival Asia 2014 is opened to guests aged 18-years and older only. ID verifications will be carried out at the door.